I’ve managed to survive another week. In no small way thanks to the amazing people I’ve spent the last two weeks with – the ones who have kept me laughing when we all felt like crying. Day one we were advised by our lecturer, Jan Douglass (http://movinglymph.com), that for the next few weeks we had “no life” – which lead to two of us instantly sticking our hands in the air and singing … “no life, without wife”. If you’re not into movies then you won’t get the reference – that’s from a movie called Bride and Prejudice, a fabulous adaptation of Pride and Prejudice, set in India (http://en.wikipedia.org/wiki/Bride_and_Prejudice). After two weeks of singing that refrain I just couldn’t resist, I had to watch the movie tonight to celebrate being half way through the course. And to celebrate passing my first lot of exams. This week involved a lot of physiology study, a lot of talking about how the lymphatic system works, a lot of practices of sequences, “specials” – special tests and treatment for specific areas that are commonly problematic, like the shoulders, elbows, wrists, hips, knees, ankles, and a fair amount of panic. On Thursday morning we had our theory exam and this morning we had to pick a slip of paper with two body parts on it and do the sequence for treating the areas – without any notes. If only you knew the volume of new information we have been subjected to in the last two weeks then you might understand the panic of trying to memorise every sequence for the entire body on top of all the theory. I had to perform the sequences for the bum and right arm on my “client” and she had to do the nape of the neck and the breast on me. 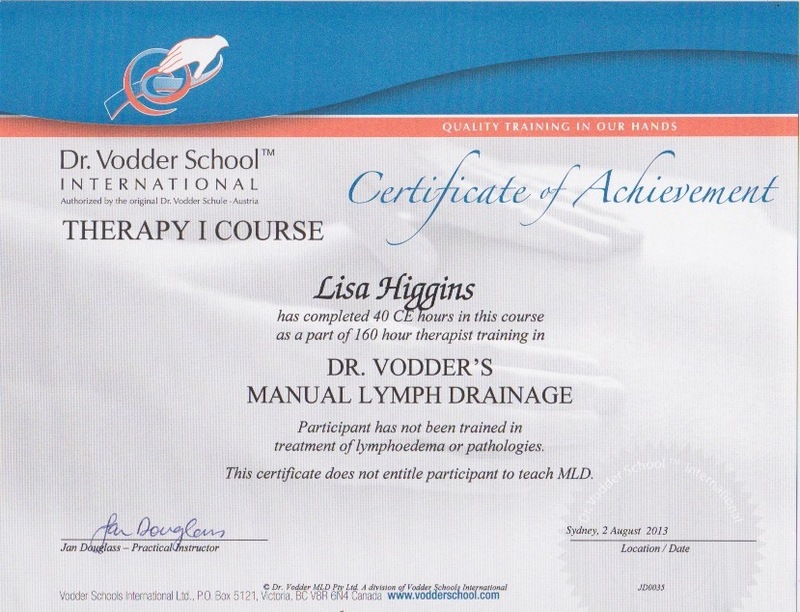 Let me point out here that all manual lymphatic drainage is done skin on skin, think about it. I have had the breast sequence done on me three times in the last two weeks, twice by men! I guess you lose all inhibitions after a few days. On Monday and Tuesday next week it will be all theory with Prof Neil Pillar (http://www.flinders.edu.au/medicine/sites/surgical-diseases-and-sciences/staff/professor-neil-piller.cfm), followed by another exam. The rest of the time will be spent with Koby Blanchfield (http://vodderschool.com/accredited_practical_instructors) who will teach us the practical component for treatment of people with impaired lymphatic systems and all our bandaging. Another week with “no life” … but lots of learning! I know! It doesn’t feel quite real somehow.